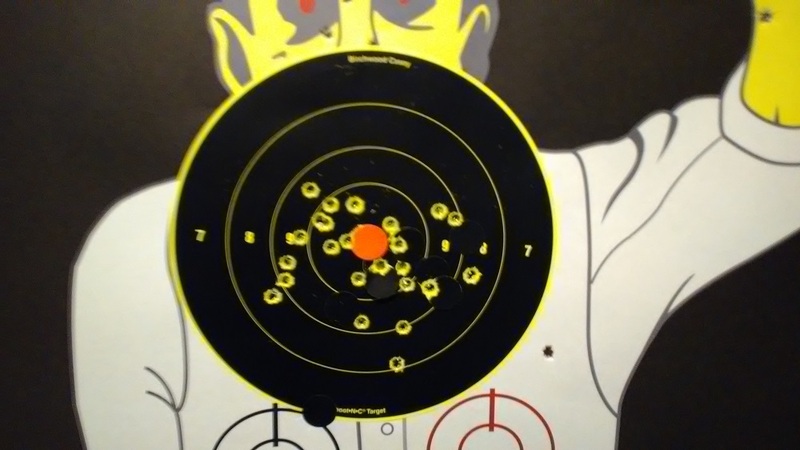 I had my FN PS90 at the range yesterday, this target was from 75 feet out, 25 rounds in or close to under 30 seconds. It looks like I only missed once. I did not have a timer on me, so I am only guessing. And pardon the pun, but the FN PS90 is a blast to shoot. I did a second target at the same distance, the target looks very similar. I have a PS90 too, and have owned 2 others in the past. Those are the armor piercing rounds if I am not mistaken. So, about a year ago (Christmas break), a pal of mine and I went to rent some guns. He is Australian and chooses not to buy here in the US, only rent. He tried a PS90. I was curious about this ...rifle...myself. He bought various FN factory ammo at the range, and we squeezed off maybe 150 rds or less at distances from 21' to range's max which is 50 yards (guessing). Now personally, I don't "get" sub-guns. I thought that concept was on the outs, as variants of M4, SIG, and dozens of others had swept most of that away as hugely more effective for room clearing and going to range in-needed. Don't ask me, that's what Operators and field experience are for and God knows we've had enough CQB in our military last twenty years. + Open sights worked OK and clearly it's an accurate little critter. The long barrel is necessary to be compliant with law, though ridiculous. +/- I have an FS2000 and know lots about FN quality and quirky manual of arms, so soft trigger, safety, etc. are old news. - Never have a seen a weapon more needful of a quality red dot from Aimpoint or one of dozen of other good options. Otherwise just don't bother. Applies to the FS2000 too, btw. - Seems pretty pointless if not select fire. Otherwise kicks like a 22 Magnum, if that. With a 10" barrel and select fire, to go with the big magazine, purpose would be suppressive fire at short range, right? Nothing more or less? + FN quality is awesome, in both PS90 and FS2000. I thought the breaker might be round cost: as of 11/30/18, .50-.60/round seems normal. Compare/contrast to the type of 223 my FS2000 likes: 75-77gr, which in-bulk is about .80/round. That's for good, accurate stuff. A bit less-accurate, but great for plinking, is American Eagle 62gr at about .50/round. So, seems to be a wash! I can't figure out the purpose of the FS90 besides what the design clearly indicates, that being a crew weapon for maybe helicopter pilots, tankers, other drivers. Not sure if the cops or SpecOps would have lots of use for it. There are worse things than a small bullet hose, but that goes to my second point: the weapon would drive me crazy if "not" select fire (Class III). Those are illegal in WA State, my home, though not nearby Oregon. SBRs are now legal, that has changed past few years. Last is price, SBR semi-auto versions I could find online (legal, with stamp, that you'd have to apply for) were $2-3K. Whoa. I've built out my FS2000 rather carefully since 2010, and think I have it right. It's bigger and heavier than a PS90, and longer. Not a lot, but it is. Bullpups are great, all-considered. I'm left with: "whatever floats your boat!" and some called my FS2000 weird, too. Until I ran it through several urban rifle course successfully, alongside students with (mostly) M4s and a few SCAR 16s. "Better" is subjective but to me non-bullpups are a bit silly, not the inverse. Does anybody sell reloading components for the 5.7 X 28? It's a centerfire cartridge and in principle could be reloaded, but I have never seen the 5.7 bullets as components. You could probably swage your own jacketed bullets using .22 rim-fire empty brass as jackets, (making 52-53 grain .224 (5.56) bullets out of empty rim-fire brass is how RCBS got started) but setting up to swage bullets is a bigger investment than ordinary reloading. I guess you could do a cast bullet as well, custom molds are easy to get anymore, but not sure where you would get loading data. For that matter I have never seen loading data for this round. Answering my own question - apparently the "5.7" is actually a .224 bullet, the round can be handloaded or re-loaded but the chamber is cut with a reverse taper (to retard action unlocking, probably) and this makes case life rather short. I'm good with my 32s - from ACP to 32-20 - for smallbore pistols/revolvers. So probably won't be buying a 5.7. But never say never. From what I understand the FN PS90 was created for the secret service, they wanted a round that came in for 1/2 the weight of the 9MM, but close to the same impact. The 5.7 * 28 cartridge meats that criteria. So for the same weight you can carry twice as much ammo, or for the same number of rounds you would have 1/2 of the previous weight in a load out. Also the FN PS90 was designed from the shooters perspective, that bull-pup design, allows the weapon to be closer into your shoulder, even with the stock fully collapsed on an AR-15, the FN PS90 is still shorter. And the FN PS90 drops the brass directly down at your feet, it does not need to try and kick the brass out of your way and fight gravity. And since the magazine is top loaded, you can be prone with the rifle and it will not have to try and balance the rifle on an oblong magazine, it can lay flat. Yes the 5.7 * 28 round is the .224; but most often it is in the 40 grain or less category. I am sure a round can be worked up in the larger grain's for the .224; but I have not gotten to the reload of that round either yet. No. SS190 are the AP rounds. 198 is restricted by FN to LEOs, but is also available to EMS workers, prison guards, probation officers and others. But some vendors will sell it to everyone. It just has a little more speed than the SS195 ammo. Actually, it was originally created as a military weapon. But the secret service did adopt it later. Good to know, I will be the first to admit when I made a mistake.